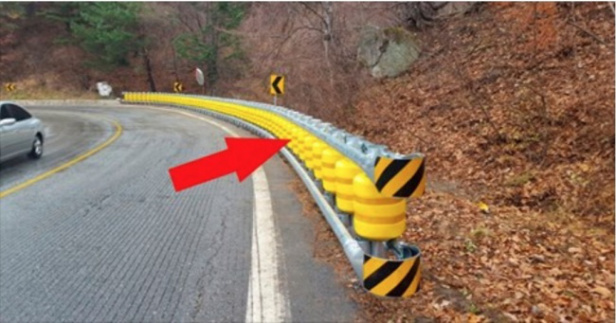 Home cars health health news healthy street useful worldhealthinfo THIS SEEMS TO BE JUST AN ORDINARY ROADSIDE BARRIER, BUT YOU’LL BE AMAZED WHEN YOU SEE IT IN ACTION! all know the metallic barriers at the side of roads that are supposed to keep people safe by preventing the vehicles from going off the highway. Nevertheless, in case that some vehicle hits one of these barriers at great speed, it and the people in it may suffer some serious consequences. The South Korean company ETI has recently developed a new type of barrier. This new barrier has been specifically designed to save people’s lives and lower the risk of the driver or the rest of the passengers getting injured. Right in between the metal columns of the barrier, there are plastic rollers installed which ensure that the vehicle won’t turn over and which reduce the possible damage to the vehicle. When a vehicle hits this barrier, the metal part of it will absorb the force of the vehicle’s impact, and the rollers will start turning to achieve the previously mentioned effect. We sincerely hope that this great invention will get all around the world very soon.